The period, 1823-5; the location, the Kandy and Gampola districts; the moving spirits, none other than the Governor, Sir Edward Barnes and the Military Commandant of the Kandy District, Lt.-Col. Henry Bird. The latter's brother, George, is generally regarded as the real pioneer since, Colonel Bird not being able to work an estate himself, it was George who opened the land he acquired at Sinnapitiya. It should be mentioned at once, however, that the Birds are a complicated subject. In the first place, there were two Lt.-Col. Birds — the original purchaser of Sinnapitiya and his son, Lt.-Col. H. C. Bird — and in the middle of their planting career the son changed the spelling of his name to Byrde (giving rise to a feeble joke in Punch). George, 'a tall farmer-like' man who didn't get on too well with the Colonels, stuck to Bird. Sir Edward Barnes' estate was called Gangarooa (now spelt Gangaruwa). It was only four miles from Kandy on the other side of the Mahaweliganga, opposite the Peradeniya Botanic Gardens. In the long and on the whole most impressive series of Governors whom Britain sent to Ceylon, Sir Edward Barnes gets almost top marks, both for enterprise and high spirits. According to some writers he took the job because he did not see eye to eye with the Governor General of India, Lord William Bentinck, when he was Commander-in-Chief. 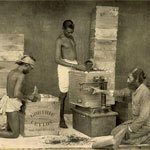 But, delightful as it would be to think that Ceylon got its pioneer of coffee through a quarrel with India's pioneer of tea, I am afraid this is not really so, since the Bentinck affair happened after Barnes had retired from Ceylon and undertaken a second tour of duty in India. Neither of the two primal estates exists as an independent unit today. Gannoruwa remained in the Barnes family for some years, but by about 1880 it had been turned over to cocoa and then became a Government Research Station. Any historically minded visitor who strolls across the pretty suspension bridge from Peradeniya may be rather pleased to find coffee there once more — in the form of experimental plots. 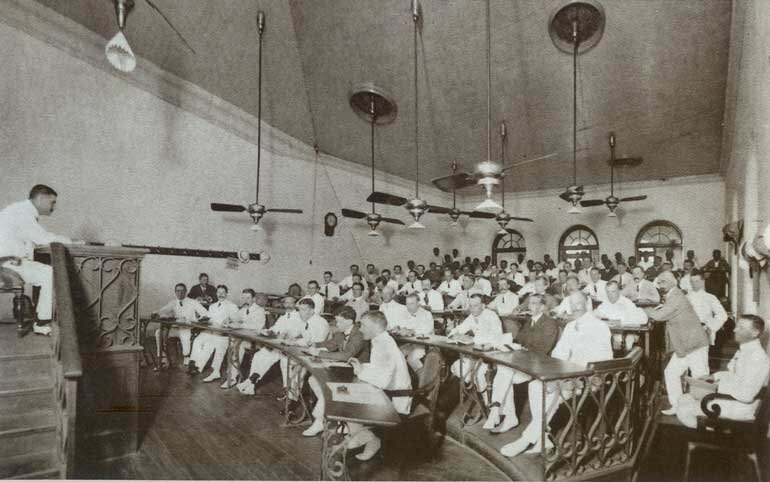 For Sinnapitiya, once a domain of the Kandyan Kings, a stranger fate was reserved. According to what John Ferguson claimed to be authentic information from the Bird family, operations there became `paralysed' after the death of Lt.-Col. Henry Bird from cholera in 1829. In 1846 the estate was sold to Frank Hudson, of the firm of Hudson, Chandler, who formed a project for farming it on 'the English principle', in conjunction with sugar cultivation. A farmer and his family were brought out from England and gradually the old decaying coffee stumps gave place to guinea grass good enough to maintain a stock of horses and cattle. Whether this strange venture would have succeeded or not we shall never know, as the whole Hudson, Chandler agency business went smash only two years later. Sinnapitiya, then reverted to the Bird family, J. C. Williams being brought over from Waloya to get the coffee going again. 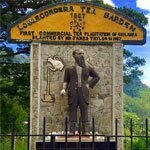 From the Birds it passed in due course to the Bousteads and into the maw of the Oriental Bank, but part of it at least seems to have become attached to the celebrated Mariawatte Tea Estate started by H. K. Rutherford and his partners in 1879, of which much more will be heard. Mariawatte itself met with vicissitudes. For a time it was nothing but rubber and now it is mostly cut up for smallholdings. There is also a small tea estate called Upper Sinnapitiya. Both Sinnapitiya and Gannoruwa happened to be situated at approximately 1,600 ft, and it seems to have been thought that this was about right for coffee; however, when after a lapse of 10 or 12 years the example of the pioneers began to be followed, other elevations were tried. 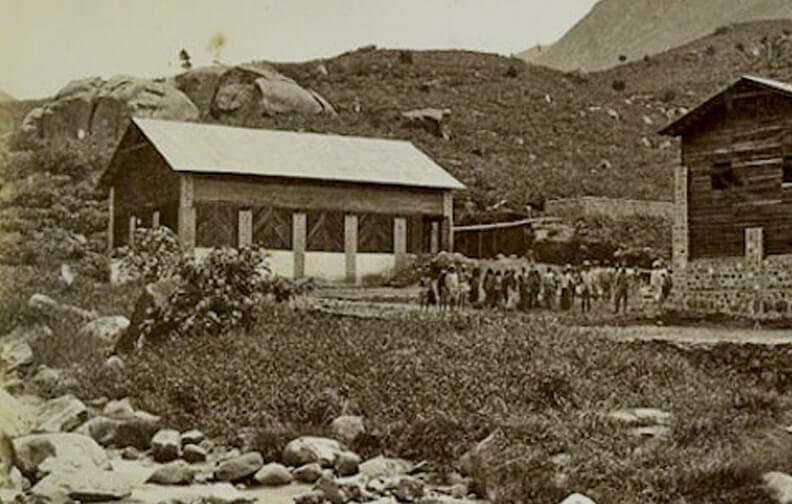 For example, the still well-known Pallekelly estate was opened, a little lower down than Gannoruwa on the banks of the Mahaweliganga, and in 1837 Lt.-Col. H. C. Byrde took what was then regarded as the risky step of trying out coffee 3,000 ft up. This was on virgin land on Black Forest, Pussellawa. It did well (though Lt.-Col. Byrde never seems to have prospered personally), and it has been suggested that the success of this clearing on Black Forest led to the ultimate rush for land to grow coffee.